Read more about NEW VOICES: Former Police Chief Says Pennsylvania's Death Penalty Is "Broken"
The Patriot-News in Pennsylvania is running a series of articles examining the state's death penalty in anticipation of a comprehensive report on the death penalty commissioned by the state legislature. Pennsylvania has not carried out an execution since 1999, and all three of its executions in the modern era were inmates who waived their appeals. Incoming Governor Tom Wolf has said he may hold off on allowing executions until the state addresses questions of fairness in the application of the death penalty. Incoming state Supreme Court Justice Thomas Saylor recently raised concerns about defense funding, saying, "If we want the death penalty, the state must provide resources to provide competent defense counsel for indigent defendants. That's the disconnect we have right now." State Sen. Stewart Greenleaf, who sponsored the resolution calling for a study of the death penalty, called the study "historic," saying, "We shouldn't run away from facts regardless of what our opinions are." Sen. Daylin Leach intends to re-introduce a bill to repeal the death penalty this year. In a series of articles analyzing Pennsylvania's death penalty, the Reading Eagle found that taxpayers have spent over $350 million on the death penalty over a period in which the state has carried out just three executions, all of inmates who dropped their appeals. Using data from a Maryland cost study, which concluded that death penalty cases cost $1.9 million more than similar cases in which the death penalty was not sought, the newspaper estimated that the cases of the 185 people on Pennsylvania's death row cost $351.5 million. The paper said the estimate was conservative because it did not include cases that were overturned, or cases where the prosecutor sought the death penalty but the jury returned another sentence. Pennsylvania legislators commissioned a cost study in 2011, but the report has not been issued. Senator Daylin Leach, one of the legislators who called for the state report, said he will reintroduce a bill to repeal the death penalty. Even supporters of the death penalty agreed that the costs are a problem: "Definitely, the death penalty extremely strains our resources," said Berks County District Attorney John Adams. Judge Thomas Parisi, also of Berks County, said he believed there was an astronomical cost difference between the average death penalty case and a life-sentence case. On September 11, four news organizations filed suit in federal court challenging Pennsylvania's secrecy about the source of its lethal injection drugs as a violation of the first amendment rights of the media and the citizens of Pennsylvania. 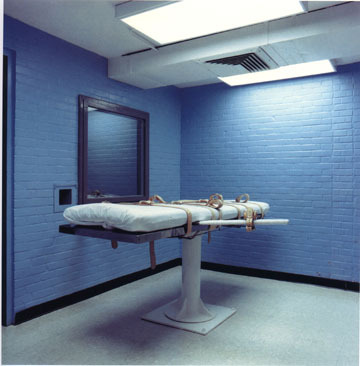 The suit was filed by the Guardian, the Philadelphia Inquirer, the Pittsburgh Post-Gazette, and the Philadelphia City Paper in advance of the execution of Hubert Michael, which had been scheduled for September 22, but has now been stayed because the state was not prepared to carry it out. Under a court order from 2012, the identity of the compounding pharmacy that provides the lethal injection drugs was kept secret. Information was released to Mr. Michael's lawyers, but not to the public or the media. “The information sought by our clients is central to the debate about capital punishment. If the drugs are not made properly, they will not work properly, and the public should be very concerned about that possibility given the gruesome executions we have heard about in other states,” said Mary Catherine Roper, the lawyer who is representing the newspapers. Media organizations have also filed similar suits in Missouri and Oklahoma over execution secrecy. The latest edition of the NAACP Legal Defense Fund's Death Row, USA shows the total death row population continuing to decline in size. The U.S. death-row population decreased from 3,108 on April 1, 2013, to 3,095 on July 1, 2013. The new total represented a 12% decrease from 10 years earlier, when the death row population was 3,517. The states with the largest death rows were California (733), Florida (412), Texas (292), Pennsylvania (197), and Alabama (197). In the past 10 years, the size of Texas's death row has shrunk 36%; Pennsylvania's death row has declined 18%; on the other hand, California's death row has increased 17% in that time. The report also contains racial breakdowns on death row. The states with the highest percentage of minorities on death row were Delaware (78%) and Texas (71%), among those states with at least 10 inmates. The total death row population was 43% white, 42% black, 13% Latino, and 2% other races.